NuFlow Phoenix is proud to provide superior, modern hydro jetting service to local homeowners and businesses in Chandler, Arizona. Our environmentally-friendly system uses the force of high-pressure water to clear your pipes and keep your drains flowing at optimum efficiency. Hydro jetting is our most highly-recommended procedure if you are dealing with frequent drain blockages or long-term slow draining. It goes beyond the simple removal of an obstruction to fully clean every inch of the drain pipe, scrubbing away thick hard water scale and built up waste that has adhered to the interior of the pipe. NuFlow Phoenix’s modern technology can both restore stopped service and promote long-term drain function in the future. To complete your hydro jetting procedure, the NuFlow technician inserts a hose with a carefully-engineered water nozzle into the troublesome pipe. 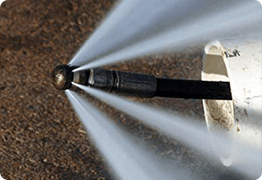 The nozzle sprays water in all directions, with powerful jets at the front end that break up difficult blockages ahead of the tool and jets surrounding the sides and back of the nozzle that clean the buildup from the walls of the pipe. The spray is strong enough to remove heavily accumulated waste, both from straight-line pipes and hidden in elbows and joints. It also cleans mineral buildup such as iron, calcium, and silica, and it breaks apart thick tree roots that have worked their way into the pipe’s connections in a search for water during dry weather. While hydro jetting seems simple, it requires an expert touch to ensure effective results without risk of damaging the pipe. This is particularly true in desert regions, where long-term heat exposure can weaken pipes. Our NuFlow Phoenix technicians are skilled in calibrating the water pressure to fully remove tough buildup without rupturing weakened pipes. For really tough clogs, hydro jetting is the most effective method for removal. Standard drain snaking can remove many blockages, but the process often results in the extraction of wet, messy, smelly debris that must be disposed of. Hydro jetting pulverizes the clog and washes it down the drain so that you don’t have to deal with unpleasant cleanup after the pipe has been cleared. If you would like to ensure that your drain remains blockage-free, you can schedule a routine annual NuFlow drain cleaning as part of your yearly maintenance schedule. Regular cleaning will keep waste from accumulating in your pipe, narrowing its diameter, and corroding its surface. This inexpensive procedure can reduce the likelihood of sewer failures, saving you money. NuFlow Phoenix is proud to offer eco-friendly repair solutions, and hydro jetting is a highly environmentally-responsible option for drain cleaning. It is chemical-free, protecting water supplies and wildlife from injury or illness. It also requires no excavation or demolition, protecting small animal habitats and reducing landfill waste. For the most effective, affordable, and environmentally-safe drain cleaning solutions available, you can count on NuFlow Phoenix. Our advanced technology solves even the most stubborn, recurrent drain problems you could face. We ensure professional service and lasting results. Call us today to learn more about how we can help you with all of your pipeline needs! Reach a qualified support representative by filling out the form below or calling us directly at 480.508.6634 and we'll be happy to assist you with all your repairs.